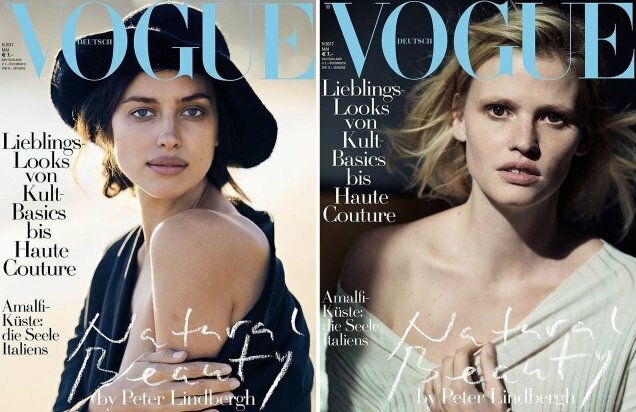 Vogue Germany is back on a winning streak, having regained our attention and received our seal of approval with a gorgeous set of Madonna covers last month. Sticking with multi-covers again this month, the German title dishes out a trio of covers featuring three of fashion’s top models for May 2017. Showing the others how it’s truly done, Kate Moss (below), Lara Stone and Irina Shayk each appear solo on the three effortless covers photographed by Peter Lindbergh. Surprisingly, the covers received mixed feedback. “Kate’s looks like déjà vu, Lara looks dead, and I couldn’t care less about Irina. Not very exciting!” reviewed an unimpressed Valentine27. “All three aren’t very good, too much reality for me. Kate is lucky because she got black and white, it’s more flattering,” wrote Nymphaea. “I like the idea of this, but aside from Kate’s, I’m not so keen on the execution of the other two images. Lara’s gloomy portrait might have its merits, but its unconventional nature means I can’t see it acting as catnip on the newsstand, not in the same way as a more glamorous shot might perform,” commented tigerrouge. “I’m so bored of the Peter Lindbergh/famous models/black and white shtick,” voiced a disapproving hfgl. “They all look like escaped mental patients,” pointed out a startled TREVOFASHIONISTO. But not everyone was so underwhelmed. “I’m baffled by the comments! I think these are great. Kate’s has that classic Lindbergh glamour. Lara’s is cinematic and unique. But – for me – Irina’s is the standout,” favored happycanadian. “I hate myself for this, but Irina’s got the best cover!! It’s not a conventional beauty shot, and her beauty here looks like a myriad of ethnic makeups, simply love it,” raved Benn98. Which cover do you prefer? Check out the contents of the issue and add your comments here.